Would you expect a dessert to be good for you? For many people, the conventional idea of a dessert is more like this: it's full of sugars, white flours and the wrong fats, it's bad for you. Only if a dish fulfills all these criteria, it can be called a dessert. It MUST be bad for you. That makes it a treat. These chocolate nuts bars do not fulfill any of the criteria mentioned above. They are quite the opposite: gluten free, grain free, no added sugar and full of proteins, good fats and antioxidants. And yet, they I'd call them a dessert. The nutritional value of these bars make them good enough to serve as on-the-go snack during the day. In fact, I eat them at any time of the day: mid-morning and mid-afternoon snack, as well as after dinner. Perhaps I should give out a warning: They are barely sweet. Perhaps not sweet enough for people who are still have a good amount of refined sugars in their diet and usually eat regular sweets and treats. The few dates and prunes in these bars are merely there to make the chocolate, nuts and coconut stick together. I am in love with its deep and dark flavor. No chances to get a sugar rush from these. Nevertheless these bars are deeply satisfying, mainly from all the good fats they contain. On top of that, prunes and dark chocolate are full of antioxidants and will have an anti-inflammatory effect on your body. You would hardly expect a dessert to be good that for you? This one is. Enjoy! In a food processor, finely chop the almonds. Add flax seed meal, coconut and dried fruit. Pulse until well combined. Add coconut oil and banana and pulse until mixture sticks together. At last, Add cacao nibs or finely chopped dark chocolate. Pulse again until well incorporated. Lay out a 8x8 inch square pan with parchment paper. Transfer mixture to the pan and press it in as even as possible. Dust with cocoa powder. Keep in the freezer. 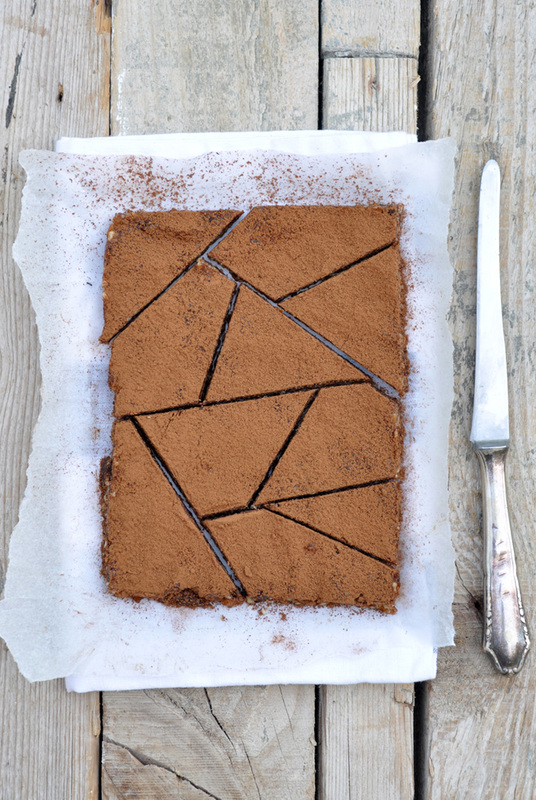 Before serving, cut them into bars, squares or triangles. Keep in the freezer for up to 2 weeks.